After more than 30 years in the role of “Music Reviewer” I am happy to report that the activity hasn’t become rote and automatic. Because, often I am pleasantly surprised by the concert experience, especially when it is outside the limitations of my initial expectations. After being asked to review last night’s Aimee Mann concert at the Barrymore in Madison, I definitely walked away feeling like I got way more than I initially bargained for (in my mind, that is). Which clearly begs the question, what did I expect? Well, first let’s look at the latest release by Aimee Mann, titled ‘Mental Illness’, a beautifully crafted album of strong material, anchored by Mann’s driving acoustic guitar rhythms and her lilting singing style. The 11 songs are typically in an introspective, borderline melancholy mood, perfect for a rainy day. But this shouldn’t shock anybody. Mann’s nearly 25 year solo career has been founded on this sort of emotion… a dark humor balanced by melodies that stick in your head long after the record is off the turntable. Akin to watching an excellent drama, and having it’s major themes stuck in your subconscious for days or weeks after. With that said, here’s my takeaway from the Barrymore show, which was overall quite uplifting. First, it can’t be understated how entertaining it is to have “geek-rock” guru (and NPR host) Jonathan Coulton as the support act for this tour. Coulton’s suit and tie and frizzy haired physical appearance, together with his goofy, almost “They Might Be Giants meets Pat McCurdy” type of comedic vibe, was 100% engaging and endearing. Straight out of the gate with his “Shop Vac” song, Coulton had the crowd reeled in and reeling with laughter. Coulton’s latest CD ‘Solid State’ was released last Friday (April 28) on Mann’s SuperEgo label, and several new songs augmented his set, which had a running theme of middle-aged married life. There was the poke at his wife’s bad tattoo (“Your Tattoo”), and the wait-for-the-punch-line ode to his children “You Ruined Everything” (from 2008’s “JoCo Looks Back”). There were also humorous digs at the age of technology, such as “Brave”, a song about a nasty Internet troll, and everyone’s favorite social media activity: posting, viewing, and commenting on “Pictures Of Cats” (which featured Mann on bass guitar and harmony vocal). The new ‘Solid State’ release by Jonathan Coulton also has an intriguing association to a hardcover graphic novel of the same name, created by Matt Fraction and Albert Monteys, which is available at the tour merchandise tables. The graphic novel has themes that warn against the dependence on artificial intelligence, and portrays a dystopian view of a future where society has become complacent and willing to be ruled by what Coulton calls “nicey-nice fascism”. 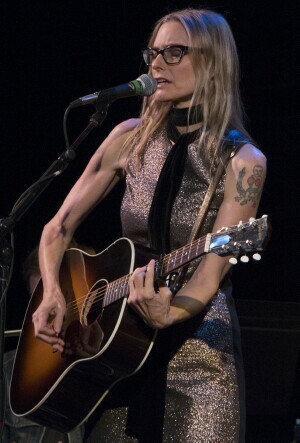 The star of the show, Ms. Aimee Mann, in a stylish “half and half” gold and black short dress (gold front/black back), stockings, and black scarf and boots, opened her 90 minute set with “4th Of July” from her 1993 solo debut album ‘Whatever’. During this opener, Mann was only accompanied by bassist/vocalist Paul Bryan. Keyboardist Jamie Edwards joined the stage next, after a playful false start on “Little Bombs”, with Mann joking about her initial lyrical mishap with a nonchalant “it’s early in the show, you’ll forget it soon enough”. Edwards is the group’s primary instrumentalist, providing most of the melody to the music, the perfect compliment to Mann’s stark yet absolutely essential acoustic guitar strumming. The keyboards reinvented themselves constantly throughout the set, sometimes cascading, and other times ethereal sheets of color and texture. Often I thought I was hearing accordion, strings, or pedal steel, but it was always Jamie Edwards’ keyboard talents supplying those parts. By the third selection (and first from the ‘Mental Illness’ album), “Stuck In The Past”, drums were added to complete the quartet. And the four musicians were the show, as the stage was otherwise bare. Simple lighting and a black curtain backdrop ensured that all focus was on the songs and outstanding performances. Honestly, the best part of this concert for me, personally, was simply to let go and allow myself to be immersed in the music and drift. Often I found myself closing my eyes and disassociating myself with my consciousness, losing my ego to the point of forgetting who or where I was. These songs had that heady of an effect. As Jonathan Coulton co-wrote many of the songs on the ‘Mental Illness’ album, he was coaxed back on stage to add backing vocals and second guitar for several selections. Among my favorites were the brutal retelling of how a friend lost her lover after she had completely reconfigured her life for him (“You Never Loved Me”), and Mann’s gorgeous turn at piano on the lyrically stunning “Good For Me”. The later being a poetic pure pop masterpiece. The set wound down with Coulton providing some vigorous tandem strumming with Mann while Edwards stretched out via extended piano soloing on “Long Shot” from 1995’s ‘I’m With Stupid’ album. To be expected, the Barrymore crowd came to their feet and gave Aimee and band a rousing standing ovation. The encores provided a strong link to the ‘Magnolia’ movie soundtrack (the Grammy nominated “Save Me” was performed toward the end of the regular set) as Mann offered her own interpretation of Harry Nilsson’s “One”, complete with jazzy bass soloing courtesy of Paul Bryan. “Wise Up” was next, and the show ended with “Deathly” which displayed one of the more poignant moments of the evening. A young lady had remained standing throughout the encores, and came right to the edge of the stage, which motivated band members to play directly to her. The final number must truly have been one of her favorites, and she swayed and danced along to every last heart-wrenching and emotive note. And, after all, music is meant to move you, isn’t it?